Why the promises of Energy Union developers to draw lessons from the Nabucco project is not yet convincing? In an interview with the Turkish publication Hurriyet on March 14 Vice-President of the European Commission Maroš Šefčovič in charge of Energy Union promised to draw lessons from the past and not repeat mistakes of the Nabucco project planned to transport gas from Azerbaijan and Turkmenistan through Turkey to the EU countries. The story of this project really deserves to be remembered today. Preparations for the Nabucco project started in February 2002 and lasted more than a decade. It was finished on 26 June 2013 when the Austrian company OMV Gas GmbH (Gas Connect Austria GmbH), which had led a consortium for the construction of the Nabucco gas pipeline, officially announced the cancellation of the project. One of the reasons for the cancellation of the project was that there were different opinions concerning its feasibility. Nevertheless, as it turned out, after almost two years the attitude to this project still widely differ, and there are those who even declare their intention to revive it. During the recent talks in Sofia, President of Azerbaijan Ilham Aliyev and Bulgarian Prime Minister Boyko Borisov agreed on a strategic partnership in order to resume the gas pipeline project Nabucco. Many of us were greatly surprised by the news. Anyway, it just indicates that the historical lesson on the importance of taking into account the positions of all potential participants in such kind of transcontinental projects is apparently ignored. As it already happened before, complex political and diplomatic maneuvers keep going on and that, sorry for the comparison, does not fit into rigid steel pipelines of gas infrastructure. Nevertheless reaching the concurrence among the countries participating in such large-scale international projects is important, but it is not the only condition for their successful implementation. The story of Nabucco revealed that the initiators of that project could not sufficiently answer two fundamental questions, which define its viability and therefore attractiveness to investments. First question concerns conditions of the markets, where gas has to be delivered by the planned pipeline. Second one, not less important, is about the availability of the resource base consisting of those gas deposits, which will provide a constant load of pipeline capacity for many decades. Correction of past mistakes on the Nabucco project promised by the European Commission deals with the Southern Gas Corridor, which the EU prioritized in the European Energy Security Strategy aiming at diversification of natural gas suppliers. 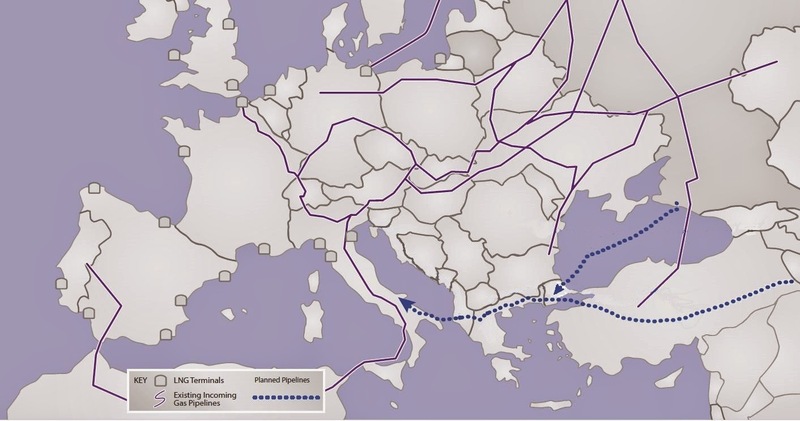 It is commonly known that the Southern Gas Corridor highly ranked among prospective gas suppliers to the EU consists of three separate projects: the South Caucasus Pipeline (SCP) via Azerbaijan and Georgia, the Trans Anatolian pipeline through Turkey (TANAP) and its continuation within Europe - the Trans Adriatic Pipeline (TAP) via Greece, Albania and Italy. Obviously, to take properly into account the lessons of the past, at first the European Commission needs to have full confidence in above mentioned key questions regarding the state of internal gas market and a guaranteed resource base for new pipelines. Let us consider current information on these issues with regard to TANAP / TAP to understand how much it is possible to avoid project failure next time after Nabucco. European part of the Southern Gas Corridor - TAP has a route length of 520 km through Greece, Albania and the Adriatic Sea (offshore part) and ends in Italy. TAP's initial capacity of 10 bcm of gas per year is distributed between three countries: the Italian natural gas grid will get 8 bcm, Greece and Albania will share the rest volume of gas by one bcm each. However, it is obvious that TAP will not be able to provide gas to most markets of South-East European countries, which are experiencing particularly high demand for energy. It refers to the countries that counted on the South Stream pipeline construction, which envisaged deliveries of 63 bcm of gas from Russia to Bulgaria, Hungary, Serbia and Slovenia and some other countries. After the South Stream project had been cancelled last December, all these countries lost opportunities to get access to new gas supplies in the nearer future. It can happen if the European Commission does not take proper care of the development of the internal gas transport infrastructure connecting South-East European countries' markets within the framework of future Energy Union. Although the European Energy Security Strategy envisages the construction of interconnectors, but its implementation will be dragged on for many years. In addition, Serbia and Macedonia should find their own funds and partners to develop their gas transportation infrastructure. Therefore, the first key issue of providing the infrastructural integrity of national gas networks can be fulfilled, and it is expected that the European Commission and its future Energy Union will play a significant unifying and stimulating role. However, there is still the second issue of the resource base - are there enough gas from the Southern Gas Corridor for all European countries concerned but not just for those countries that were originally identified in the TANAP / TAP project? Let us recall that the TANAP pipeline is designed to transport from Azerbaijan an additional gas from the second stage of the Shah Deniz deposit on the route from the Georgian-Turkish border to the western border of Turkey. Azeri gas will be delivered to Turkey via new pipes laid alongside the South Caucasus Pipeline "Baku - Tbilisi - Erzurum" which was officially opened in 2007. It is assumed that in parallel to the South Caucasus Pipeline with capacity of 8 bcm accommodating gas from the Shah Deniz Stage 1, there will be another pipeline in the same route. The new pipeline will have a capacity of 17 bcm per year, including 16 bcm reserved for the Shah Deniz Stage 2 and another 1 bcm as a technical reserve. In turn according to the initial project design, the TANAP pipeline will have the capacity of 16 bcm, of which 10 bcm should be transported to Europe and 6 bcm - to Turkey. However, in fact it is by no means enough to meet the needs of Europe. There is every indication that here is no way yet of getting away from the problem of gas availability for growing imports to Europe. Moreover, a ghost of Nabucco reminds us about it even more convincingly after the cancellation of the South Stream gas pipeline. Apparently, to look for new ways of solving this problem in December 2014 the European Commission addressed to Azerbaijan with a request to double the capacity of the TANAP pipeline. In response Azerbaijan promised that the TANAP capacity would be increased to 23 bcm but only by 2023 (and in 2026 it would be increased to 31 bcm). In the meantime, future implementation of such optimistic promises actually raises reasonable doubts. Actually, an increase in capacity would require significant changes not only in the working design of the TANAP pipeline project, but consequently in the planned new part of the South Caucasus Pipeline. In addition, such project upgrade would result in the necessity to attract new investments. Even more importantly, there is no objective evidence that now and in the considered future the Caspian region really can provide availability of sufficient gas resources to fill the TANAP pipeline with doubled capacity. It is quite clear, that to fulfil these promises by means of gas from Shah Deniz only will not be enough. Azerbaijan apparently hopes that additional gas resources can be developed. In December 2014, Company British Petroleum and Azerbaijan’s SOCAR (the State Oil Company of the Republic of Azerbaijan) signed a production sharing agreement (PSA) to jointly explore and develop potential prospects in the shelf area around the Absheron Peninsula in the Azerbaijan sector of the Caspian Sea. However, there are no certain estimates how much time it might take to start a new gas production. Due to the limits of resource base in Azerbaijan to supply gas via the Southern Transport Corridor, the European Commission included into the short list of potential suppliers presented in the Energy Union strategy two other countries of the Caspian region - Turkmenistan and Iran. In July 2013, a framework agreement was signed between the governments of Turkmenistan and Turkey on cooperation in deliveries of Turkmen gas to Turkey and to Europe. Turkmenistan's President Gurbanguly Berdimuhamedov paid an official visit to Turkey on March 3, where the discussion of Turkmen gas supplies for TANAP pipeline was continued again. Meanwhile a desire alone cannot lead to success, as well as "a good will" of the parties, even in this case with the active support of the EU. That is why it is too early to talk on any concrete date of commencing Turkmen gas supplies. In reality, there are problems, which people are trying to ignore. First of all, Turkmenistan's gas resources are currently fully focused on the Chinese market and no radical changes are in sight. There are issues, which have not been regulated yet, of which the laying of the offshore Trans Caspian pipeline is the main one. As we know, the coastal states have not determined the Caspian Sea's status. At the same time, all the countries have their own interests. For example, Iran demonstratively demands the strict compliance with environmental regulations, which shows that this country is taking advantage of the situation, not wanting any partnerships without its participation. Tehran seems to be in no hurry to give a "green light" to the development of cooperation between Ashgabat and Baku. Iran is thus promoting its export opportunities, suggesting Azerbaijan and Turkmenistan use its own transport infrastructure for subsequent transit of gas through Turkey to the EU. However, all this only prolongs time for an indefinite period, since, despite the intentions of the European Commission, Iran is far from ready to draw up concrete plans to supply gas to Europe. In this case, the situation is directly connected with the complex problems of Iran's relations with the US and Israel. Iran's inclusion in the list of prospective gas suppliers to Europe is rightly seen by the world as a political move, which will not be followed yet by real gas projects. As the sanctions against Iran, motived by its nuclear programme, remain in force, and Israel protests sharply against any hint that they may be relaxed. Thus, the opportunity of Iranian gas imports proposed in the Energy Union strategy raises rather hard political dilemma for Brussels and Washington, which requires to choose what is more important - to maintain the direct and indirect sanctions imposed on Russia including the policy of curbing gas supplies or to continue the sanctions regime against Iran. The intrigue may turn out to be that neither Iran nor Russia have anything crucial to lose in this situation. Why does the European Commission persist to prove the possibility of replacing Russian gas while at the same time referring to the willingness to take into account the lessons of the past? Why is it less important to keep in mind the mistakes with the South Stream project too that happened after a failure of the Nabucco project? Indeed, history shows that hoping for time will judge everything by itself could cost us too much.